We are continuing our efforts to provide the community fast and thorough information by posting the Niles Codified Ordinances online. For further information about a particular ordinance, please contact the Clerk of Council by email at nbacak@thecityofniles.com . 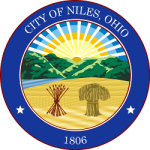 City of Niles Codified Ordinances – A complete copy of the City of Niles’ Codified Ordinances can be viewed by clicking on the link below. You can perform word searches, etc. on any topic contained in our code. The City of Niles’Codified Ordinances are codified, edited, and prepared for publication by The Walter H. Drane Company and the website and infobase is developed and maintained by Conway Greene Co.